It has been a long time since I last took a look at Amy’s frozen meals. Six years ago, I was on a frozen meal review kick and decided to look at a bunch of meals that were trying to be healthy. Amy’s frozen meals seemed healthier than a lot of the other choices. I took a look a look at Smart Ones as well. I could be buying and eating this stuff for months if I checked out all of the meals that they offer. I chose the Southwestern Burrito, Thai Red Curry, and the Light & Lean Spaghetti Italiano in an attempt to get a cross section of their food. The first thing I will say is that I have no problem with any of the ingredients that Amy’s adds to their food. They use organic ingredients, no preservatives, and I can pronounce everything on the package. This has 9 SmartPts for anyone out there who is on Weight Watchers. 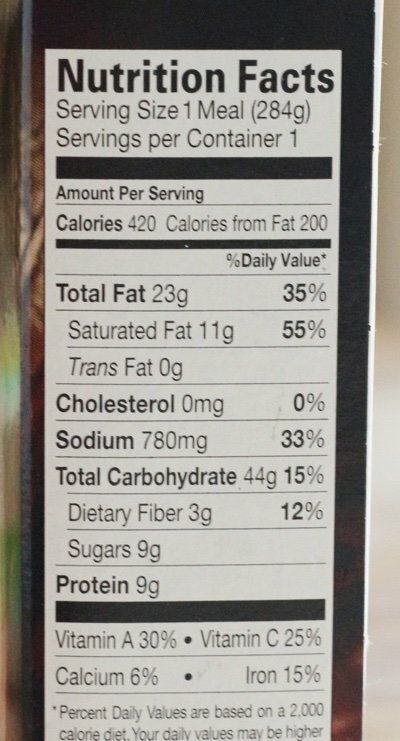 I think that the nutritional information doesn’t have any red flags but I wish there was some vegetables added and less sodium. This cost about $3 and for twice that I can got to Chipotle and get a much bigger burrito (that I can cut in half) and stuff with fresh tomatoes, lettuce, and other fresh food. I found the texture like paste and the flavor was just okay. The second meal I tried was one from the “Light & Lean” line. I noticed it is 8 ounces versus 10 ounces for the regular size. You can always make things lighter if you simply add 20% less food. This is vegan and has 7 SmartPoints. I think 25% of your daily value of sodium is far too much for 8 ounces of food and I found this dish pretty terrible. The pasta was gummy and it lacked vegetables. There were only a couple of measly stalks of broccoli. This cost me about $4.30 and I would never buy this again. Finally, I tried the Thai Curry, which is both gluten and dairy free. This meal was a whopping 16 SmartPoints and I believe it was because of the coconut milk. The saturated fat in coconut milk is thought to be different than the saturated fat in meat but Weight Watchers counts it the same. This meal, again, was way too salty BUT it had a lot of vegetables and it tasted pretty good. I guess that is what happens when you add 23 grams of fat to a meal. It is about the same amount of fat as in 8 McDonald’s chicken McNuggets. But, this is filled with vegetables not deep fried chicken and I think (except for the sodium) that this is a pretty good choice. 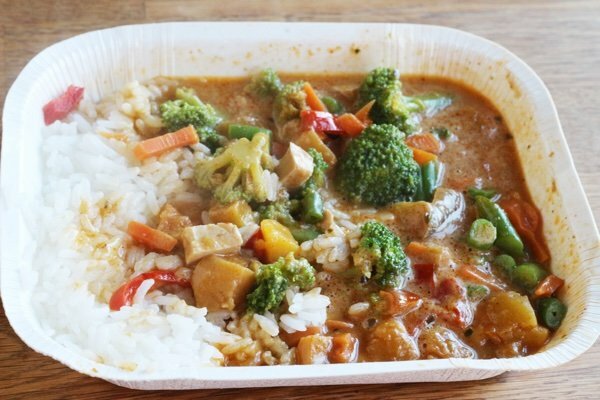 This meal makes me want to make my own red curry and see how well it freezes! 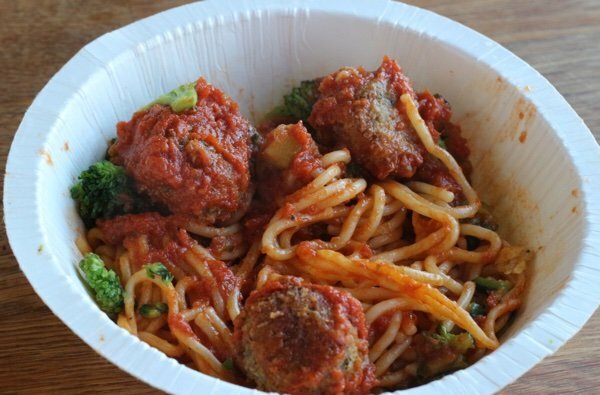 What do you think of Amy’s frozen meals? Please share. 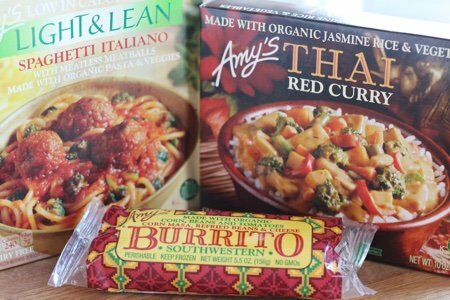 Amy's Frozen Meals: Are They Healthy? The questions keep rolling in about the frozen foods aisle and I am ready to go! I love frozen meals! When done right they are as good as a fresh home-made meal. I fill my freezer with pints of home-made meals, bags of broiled meatballs, raw thai-turkey sliders, individual sandwich steaks, marinaras, chowders, seasoned breadcrumbs, various cheeses, pestos, blah blah blah. In so doing, no supermarket frozen meals entice me with their marketing pictures that always fail to please. I have tried a very few and never again, years ago even gave organic ones like Amy's a try - blech!. Whatever and whenever you cook, make your time count by making extra for the freezer and use those nutritious meals for kitchen-freedom! For a good example, yesterday I made a 2lb meatloaf for my weekend visiting son and squirreled away 2 mini loaves for the freezer. Extra time? less than 5 minutes. Lisa! I want to make that red curry too with brown rice (and freeze some); please share the outcome! Agree with BarbL - making your own frozen food is the way to go! Recently we were beset with illness all though the house, and mom and dad were not spared. We shuffled through the grocery store one day looking for convenient pre made meals for both ourselves and kids as we were just not up to cooking. Among other things, we chose an Amy's veggie enchilada, which was pretty high in sodium but otherwise fairly tasty and a decent amount of veggies. We also chose Bell & Evans frozen chicken tenders, a rotisserie chicken, a pile of raw veggies from the salad bar and some pre-made soups from the "hot" bar. All in all, lots of sodium and pretty expensive - but in a pinch, an ok way to eat for a few days. I can't imagine doing it too often though. Sodium is one of the things I look at and Amy's 'always' has too much!! Can anyone explain why all frozen meals in general are so chock full of sodium? If the food is frozen then I would assume that such a high amount of sodium would not be necessary. I keep trying different diet frozen meals but I have yet to find one that tastes good. Just make extra and freeze them yourself. I rarely buy frozen dinners but I did see "Evol" brand Qunioa & Roasted Veggies at my local Grocery Outlet. The nutritional stats (https://www.fatsecret.com/calories-nutrition/evol/quinoa-and-roasted-veggies) looked pretty good so i decided to try it. I was very pleasantly surprised....it is very good!! @Carol, RD here. Processed foods usually rely on sugar, fat, and salt for flavor. Sugar has four calories per gram, fat has nine, but salt has none. Salt is an inexpensive flavor enhancer that does not add calories. For those under 50 without health issues, a good rule of thumb is to limit sodium to 2400 mg daily. For instance, <600 mg per meal and <200 mg per snack. Healthy Choice meals are moderate in sodium. Per FDA standards the word "healthy" on a label indicates no more than 600 mg per meal. You should try the Sweet Earth brand of frozen meals. They are delicious, and a natural food brand. I really like Amy's cheese enchiladas and have eaten quite a few over the past couple of years. I have also tried the macaroni and cheese and it is pretty good. However, today I tried the pad thai for the first time and it was awful. The vegetables were bitter and the sauce just tasted "off". I have had other pad thai dinners but have to say this was not good. AMY. DO YO ACTUALLY TASTE YOUR FINISHED PRODUCT ? ?I am 79 my husband 87 and we do not eat meat so have a lifetime experience of cooking tasty dishes .and thought this might be handy to have in the freezer when feeling too tired to cook .YUCK. NEVER AGAIN Will stick to my own frozen meals .What a waste of money !!! !